Across the board, maybe one of the most talented groups in the past 10 years...at least on paper. Couple that with the overall speed and strength increase that the whole team seems to be benefiting from, and you have a powerful, experienced and game-breaking secondary. We may not be as deep as we were in the past, but we do have some talent coming in that could be called upon to step up. Starting on the corners, covering typically the standout WRs, is senior Morgan Trent (6-1, 188). I don't think anyone on this team has more experience than Trent, at least on the defense. He's a three-year letterman, and a two-year starter. He's the active career leader in pass break-ups and interceptions. He has 108 tackles, five tackles for loss, four interceptions, two fumble recoveries and 19 pass breakups. Tied for 12th on Michigan's career pass breakup list with Ty Law. 92 of his 108 career stops are solo efforts. 2007 All-Big Ten Conference honorable mention, 2005 Freshman All-America honorable mention. On the other corner is Donovan Warren (So. 6-0, 180). 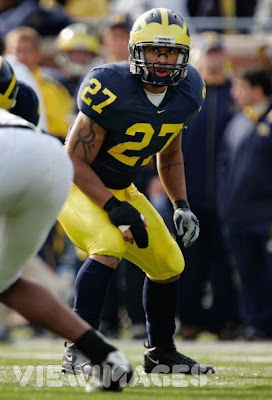 Talk about talent, Warren was a starter right out of the gate at Michigan. He started 11 of the 13 games in 07. He posted 52 tackles, 2 fumble recoveries, 1 interception and 6 pass break-ups. He was a freshman All-American. With a heavy reliability by post of Michigan's opponents on the pass, both Warren and Trent will be vital in the defense's success. Safety Stevie Brown (Jr. 6-0, 209) is a relative veteran in the backfield. He's a two year starter, and has played in 26 consecutive games, has 42 tackles during career, recovered two fumbles, forced one fumble, batted down two passes and intercepted one pass. Also a special teams contributor, posted 23 career special teams tackles. On the other safety spot, Brandon Harrison (Sr. 5-9, 206) is another long time veteran of this defense. Three-year letterman, made 20 starts in the defensive backfield at both corner and safety, has seen action in 38 games at Michigan. He has 96 tackles, 9.5 tackles for loss, 3.5 sacks, two fumble recoveries, three interceptions and nine pass breakups ... The Sporting News Freshman All-America second team and The Sporting News Freshman All-Big Ten in 2005. Also worth noting are Troy Wolfolk (So. 6-0, 195), and Charles Stewart(Sr. 6-2, 206). Both could easily see time as a starter or reliable backup. Freshman that could make an impact, J.T. Floyd, Boubacar Cissoko and Brandon Smith. The dates atop your entries are almost invisible. Easy fix, no? Agreed, we'll get our top designer on it! Some sort of goof-up in my CSS style sheet. Thanks for the shout out.